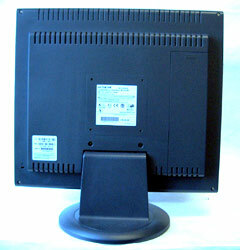 Abstract: Among the amenities we find a side mounted cable connection causeway for easy access, a swivel base, and support for both analog and digital DVI display signals. Flipping the display around to the rear we can see where the cables connect is at the side of the display and not the bottom. 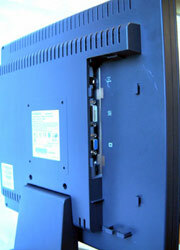 By their thin nature, most LCD displays get flipped over onto their heads so that the cable connectors can be installed by the user. With the relocation of the power, analog and digital signal cable connectors to the side of the unit, it is substantially easier to gain access and set up the unit from the get-go. A small plastic cover slips over the cable connectors and wires, and this hides everything from the users perspective so there is really no loss as far as we are concerned. This is also something older folks will probably appreciate, as the level of accessibility is greatly improved over standard display connector locations. 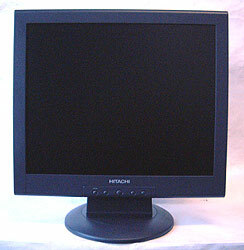 With the feathery weight of most LCD panels, a lot of manufacturers skip on rotating stands. Hitachi have shown us a few models in the past which have come with integrated left and right swivel bases, and the CML190SXWB follows suit. The display panel will rotate to either side about 45 degrees which should be ideal for most situations where you need to move the display to allow a co-worker a better view of a chart or website for example. It's also worth mentioning at this point that the viewing angles are 85/85/85/85 degrees (up/down/left/right) so the display is already pretty well endowed in this area. There are no mechanisms built into this particular stand for vertical height adjustments (very few displays seem to anyway) but the tilt mechanism will give you about 2 degrees down, and 25 degrees back. Again, the vertical viewing angles are on the order of 85 degrees, so image colour remains pretty good at extreme angles. We've tried to show the range of the tilting on the Hitachi CML190SXWB to give you an idea of what to expect.